When we were at Walt Disney World for Ron’s birthday this year, we were finally able to get ADRs (Advanced Dining Reservations) for The Plaza Restaurant in the Magic Kingdom. Since we are semi-local and most of our trips are planned 30-60 days in advance at most, sometimes getting ADRs can be difficult. We had tried for The Plaza several times without success so we were excited to finally get to try it. 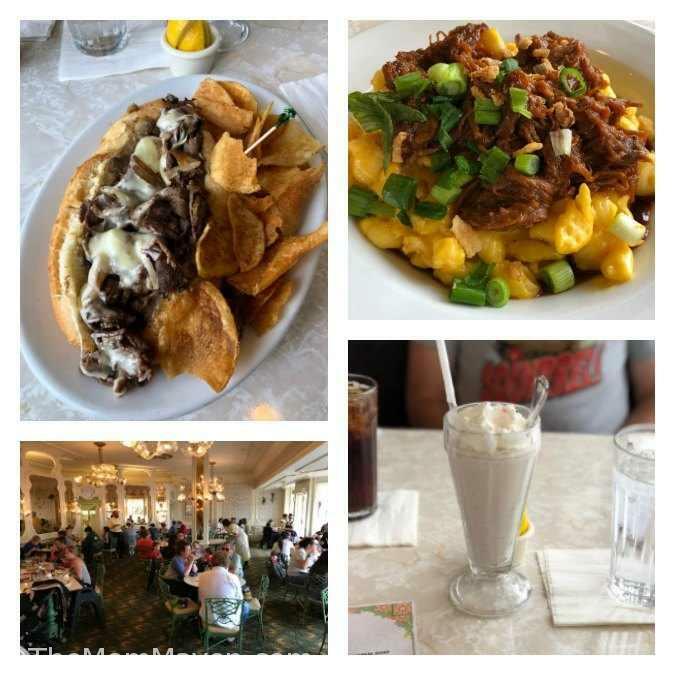 The Plaza Restaurant is a beautiful hidden gem in the Magic Kingdom. The turn-of-the-century art nouveaux decor is just perfect for a Main Street, USA restaurant. The Plaza is located at the end of Main Street, just around the corner from the ice cream shop. We checked in about 30 minutes before our ADR time, you are supposed to check in 15 minutes before. We were warned they were running a bit behind schedule and that we would have to wait 15 more minutes to check in. When that time passed we checked in and received our buzzer. We waited about another 30 minutes, about 15 minutes past our ADR time, not bad since they were supposedly running behind. We were seated in the Solarium (yay!). The first thing the waitress told us was that they had All-You-Care-to-Enjoy Milkshakes, HELLO! Yes, please. They always have vanilla, chocolate, strawberry, and mint chocolate chip, then they have a flavor of the day. The day we were there the flavor of the day was Oreo! I was very excited, and yes, I drank 2 milkshakes while we were there. There are so many delicious items on the menu, we had trouble choosing. I ordered the Baked Honey-Barbecued Brisket Mac & Cheese and Ron got the Cheese Steak Sandwich. We were both very pleased with our selections, they were delicious. We want to go back and try other choices like the Home-style Meatloaf, Angus Chuck Cheeseburger, Grilled Chicken Sandwich, Plaza Club, and Honey Barbecued Brisket Burger. You can see the full The Plaza Restaurant menu here. 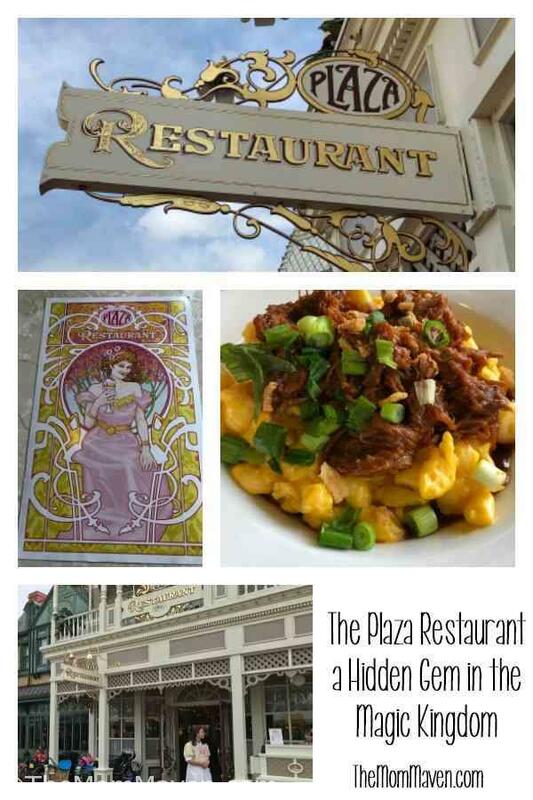 The Plaza Restaurant is our new favorite table service restaurant in the Magic Kingdom based on food quality, service, and price-it just can’t be beat. I’m hoping to dine there on our December trip, I need to figure out which day is our Magic Kingdom day so I can actually get our ADRs in advance for once. If you are thinking of planning a magical Walt Disney World vacation, I’m here to help! I am a travel agent with Destinations to Travel, a Disney Earmarked agency. My services are free to you and I will navigate the crazy waters of planning a Disney vacation with you, including booking your ADRs and Fastpasses for you! Please Email Me to get started on your magical journey!